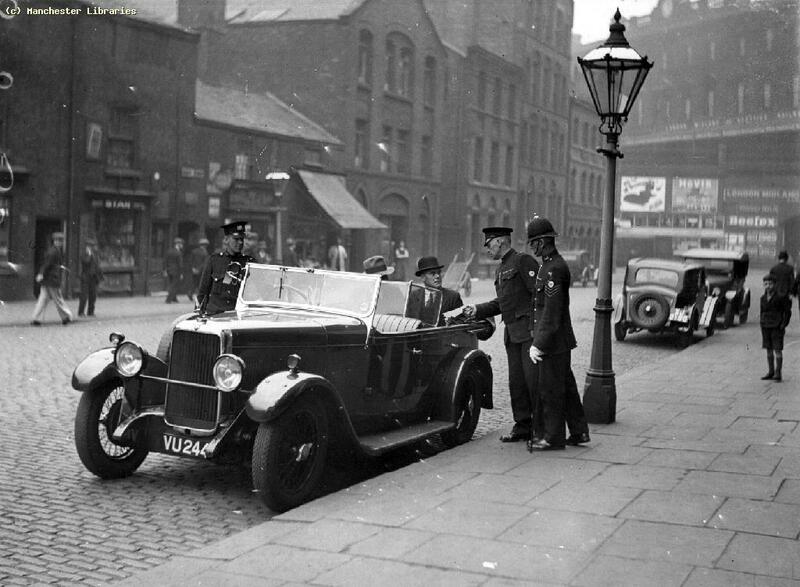 Whitworth St, Manchester City from police station door in 1935. Note London Rd railway station at rear. 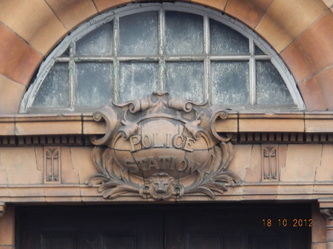 2012 photographs of the Police section of the complex on Whitworth St at the opposite corner to the main facade and bank building at the corner of London Road and Fairfield Street. Two exits for police vans and ambulances can be seen on Minshull St South. 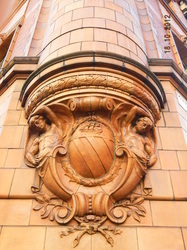 The numerous ornate motifs on the building include the Manchester Coat of arms on this far corner. London Road Fire and Police Station. 9th June 1899 A public notice to be made of the right of the Local Government Board to hold a public inquiry on the 20th June at the Town Hall into the purchase for a ‘fire station’ of £7,050 of land and £60,000 for its technical construction. Also £4000 for a public baths. 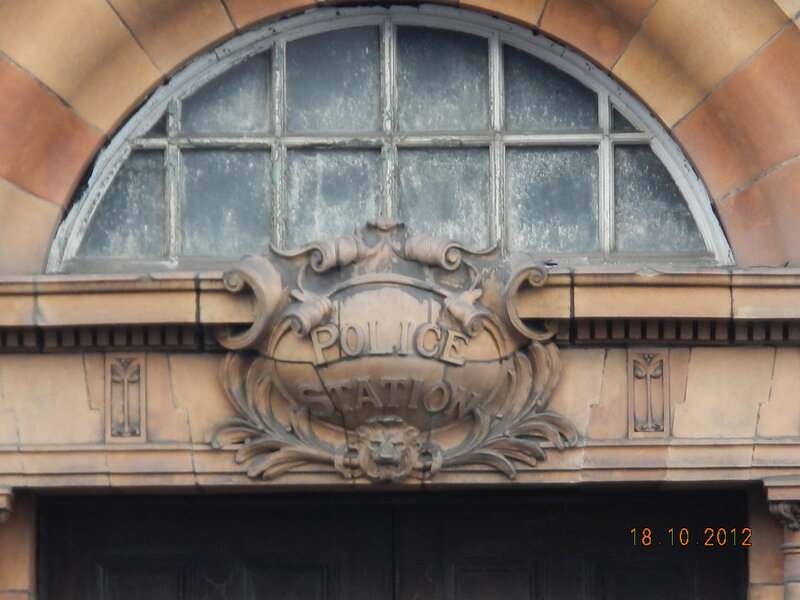 3rd Aug 1899 After consideration of the report by the Inspector Colonel Cooke after the inquiry at the Town Hall of M/cr the Local Government Board have decided to comply with the application. 10th Aug 1899 The Chief Fire Officer is of the opinion that Newton St site is unsuitable for a Chief Fire Station. Resolution for the CFO to present a report giving the quantity of land required for housing of men, horses and engines including the disadvantages of the Newton St site. 14th Sept 1899 CFO report submitted to the WC members. 4th Jan 1900 General Council minutes. Land bounded by London Rd Fairfield St and Whitworth St to be sold to the WC for £25,000 and Chief Rent of £45p.a. To ‘stop up’ street on London Road site by Magistrates order prior to the hoardings being erected on Back Acton St.
1st March 1900 Williams and Deacons Bank enquire as to the vacant plot on the corner of London Rd and Fairfield St and whether they would entertain a bank on this corner. 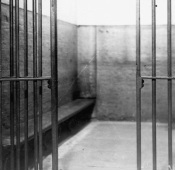 1st March 1900 LUSC: Regarding the Chief Constable’s report to Mr McCabe. ‘In response to making another report. If the Committee were to put their energies into putting Newton Street and the C Division stations into proper order they would have sufficient work on hand for the present’. 12th April 1900 Resolved to prepare the plans for London Road. 24th July 1900 Plans for the new Fire and Police Station to be given up for public competition and prizes of £400, £200 and £100 then amended to £300 £200 and £100. 16th Aug 1900 City Surveyor and Town Clerk to place an advert for the new plan submissions. 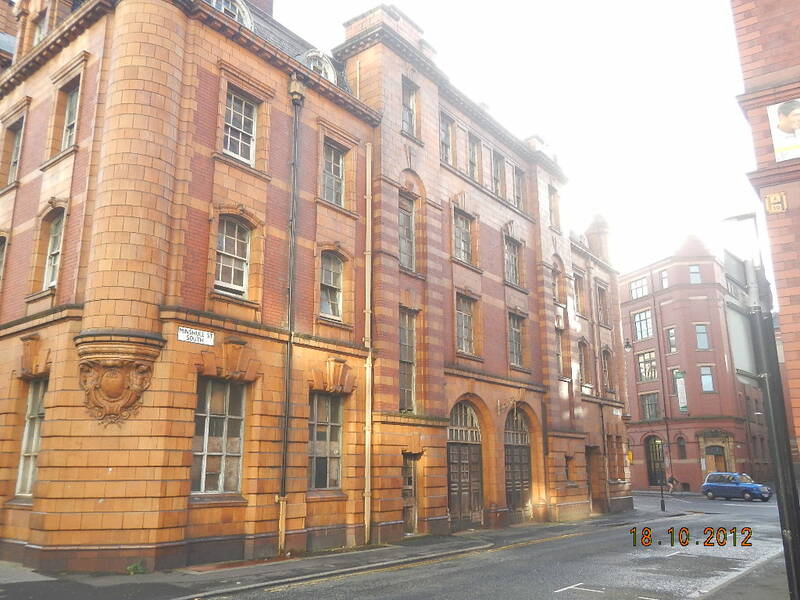 16th Aug 1900 Manchester Corporation Act 1901 – clause inserted to authorise purchase appropriate land between London Road Fairfield St and Whitworth St for the new Fire and Police Station. 30th Aug 1900 Advert placed. 7th March 1901 Williams and Deacons and Manchester and Salford Bank Ltd state the first floor and basement would be required for their bank at London Rd. 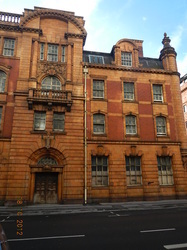 11th April 1901 The General Committee recommend: the cost of the building at £75,000, Fire alarm systems installation £10,000 [see photo of control room], £3,750 architects commission at 5%. Adverts to be placed in the Manchester; Guardian, Courier, & City News and the British Architect and Builder. 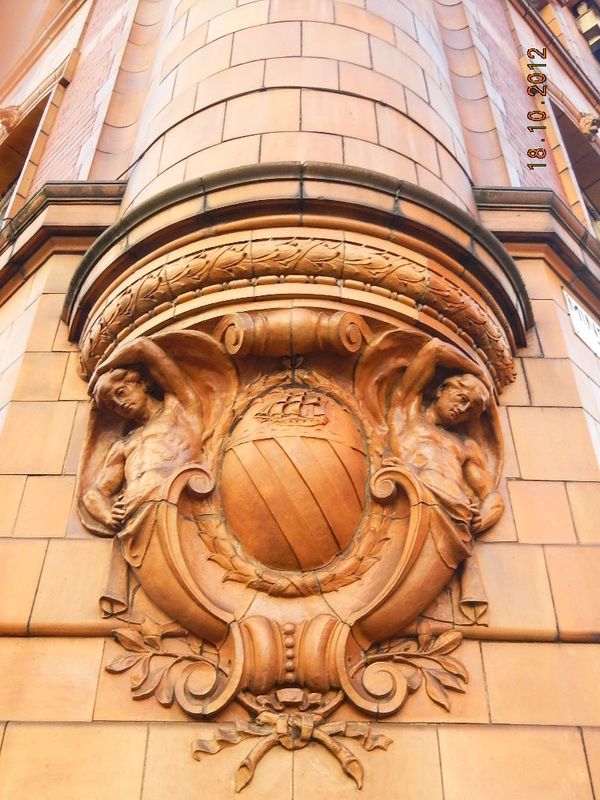 2nd May 1901 The Royal Institute of the British Architects raise concern that; there was no advantage for London architects as no travel expenses, also that the commission was 3% not 5% and that the absence of a professional assessor was noted. 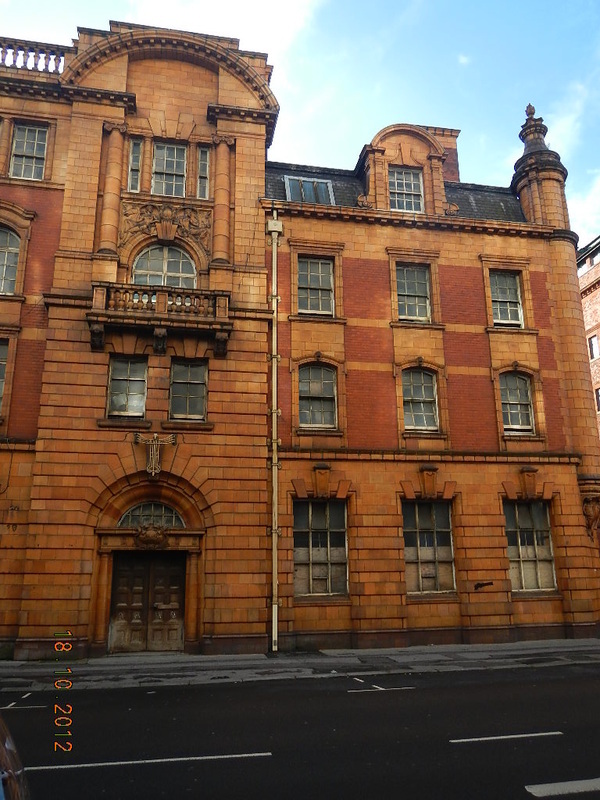 15th May 1901 Quinquennial Valuations: London Rod site £25,000. 27th June 1901 Fifty applications have been received for the conditions of the competition. Thomas Worthington FRIBA FMSA approved as the professional assessor of the competition. Salford born ‘gothic style’ architect of the Minshull St Courts, Ellen Wilkinson School, the Albert Memorial and the Memorial Hall opposite the Town Hall, amongst others. 22nd Aug 1901 The Lord Mayor to allow the use of the Town Hall banqueting hall to display the designs of various architects to be inspected by Mr Worthington. 19th Sept 1901 Thomas Worthington selects plans for 1st 2nd and 3rd place as no’s 23,25 & 19 respectively all under the £75,000 tender. £300 to Messer’s Woodhouse and Willoughby & John Langham, Manchester. £200 to Mr George Watson, Edinburgh. £100 to Messer’s Manguade and Littlewood, Manchester. 14th Nov 1901 Woodhouse and Willoughby write to acquire role of the quantity surveyor at a fee of 1¾ % as previously frequently commissioned to enable exacting standards and reduced costs to the Council. Mr Thomas Worthington’s fee £105. 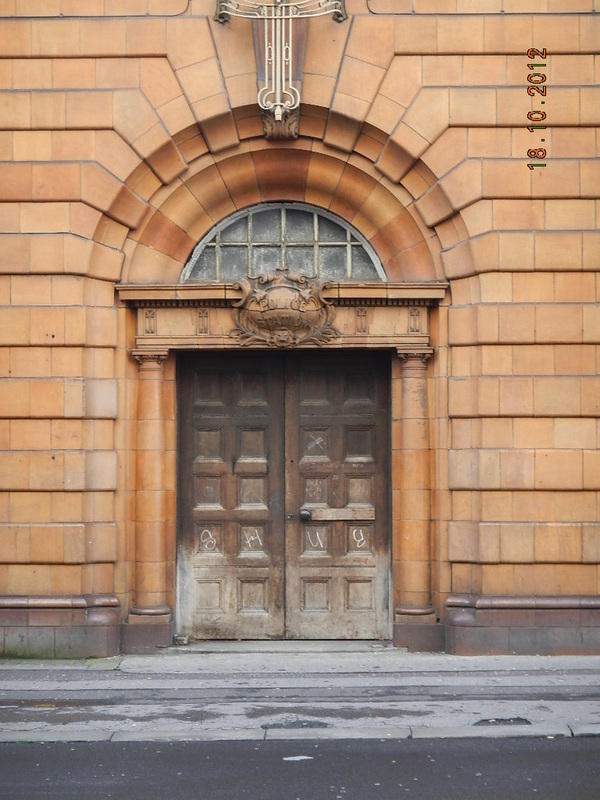 To arrange to exhibit the plans for London Road Fire and Police Station. Request for the Williams and Deacon Bank to be tenants of the area designated to banks. Agreed by the W.C.
6th Feb 1902 To move on with the foundations as the plans and the quantity survey are redrawn. However the expensive swimming bath and plunge pool in the basement is withdrawn. 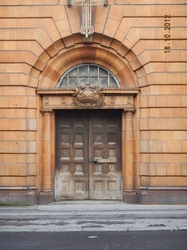 The building would take more years to complete and inhabit and became one of the finest fire stations in the country. 2012 The building still stands and is subject to a debate between the Council and the current owners as how best to protect and restore the building for future use. 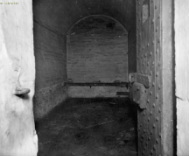 I have included a link to the excellent Our Manchester website below where many more photographs, including two of the cells courtesy of English Heritage, are posted. 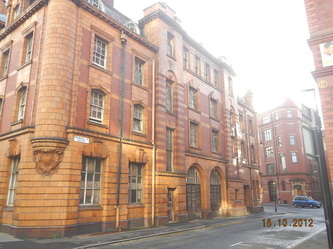 The link expands into numerous other Manchester buildings, tours and information.